Who's your Granny! 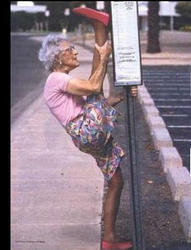 A Grandma has won all but one year...can anyone step up and take the Grandma's down!!! We look forward to seeing all the different "Grandma Costumes" to be worn by as many of the brave runners that dare to...its a fun run to watch even if your not running...each year the fake Grandmas hope to run down the Real Grandmas due to the handicap head start lead that all women and older Grandpas get...See You at the start line which will be a little bit down from the zoo on Butterworth street at the corner of butterworth and obrien streets....the first runner leaves the starting line at 9 a.m.! This race is open to all runners but if you are a guy you start behind the ladies and try to catch them. It is a very unique and fun event so come on out and see if you can Beat the Grandma! THE RACE WILL START at 1700 Butterworth St SW, Grand Rapids, MI 49534...it is not at the zoo! You can pre-register by mail, just click on the entry form page above, fill it out and mail it in. That gets you a free t-shirt in your size and you save $5. THERE IS RACE DAY REGISTRATION AT THE STARTING LINE starting at 7:45 a.m. till 8:45 a.m.
Come on OUT and See if YOU can BEAT the GRANDMA!!! If you get in the top 50...you will bring home a medal!!! Special awards to the overall male and female runners. RACE STARTS at 9 a.m. with the first runner leaving the starting line. AWARDS: Medals to the top 50 finishers and cool tshirts given to all pre-registered runners and available while supplies last on race day. RACE LOCATIONS: at 1700 Butterworth St SW, Grand Rapids, MI 49534..so look for a new PR as you Chase down those Grandma's!!! Race T-shirts are guaranteed to all pre-registered runners and are available on a first come first serve basis while supplies last on race day. RACE IS RUN on a Bike Path the whole way and is closed to traffic...baby joggers and strollers are OK!!! Do You Have What It Takes?...to Beat the Grandma!!! there will be Grandma's Homemade Cookies waiting for you at the Finish Line...that is IF Grandma doesn't Beat You to Them!!! Race Day Registration is $20.00 will be in the morning at the start line from 7:30 a.m. till 8:50 a.m.
As a kid growing up I always enjoyed visits to Grandma's House. As with most Grandmas, you could always count on there being treats at Grandmas. But there was nothing like Grandma's Homemade Cookies!!! Whether they were Peanut Butter, Chocolate Chip, or Oatmeal...they were always a big hit. On Sat. June 30, 2018, you will not only have a chance to RUN and TRY to BEAT the GRANDMA...but you will also get a chance to relive those childhood memories of eating Grandma's Cookies one more time! This means that if you run this race you can enter the lottery to run in the Labor Day Bridge Run across the Mackinaw Bridge visit www.michiganfitness.org for more details.